Pakistan has developed short-range nuclear weapons to counter the ‘Cold Start’ doctrine of the Indian Army, country’s Prime Minister Shahid Khaqan Abbasi said on Thursday. 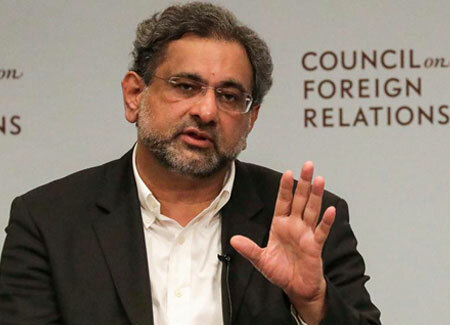 Abbasi was addressing a gathering at the Council on Foreign Relations, a top American think-tank, on his maiden visit to the US after taking over his new office. On Tuesday, he met with US Vice-President Mike Pence. He will address the annual UN General Assembly session on Thursday. The Indian Army’s ‘Cold Start doctrine’, developed for a possible war with Pakistan, involves various branches of the Army conducting offensive operations as part of unified battle groups. The doctrine intends to allow India’s conventional forces to perform holding attacks to prevent nuclear retaliation from Pakistan in case of a conflict. However, Abbasi said that the command-and-control systems they have in place are as secure as anybody else’s in the world. The Nuclear Command Authority (NCA) of Pakistan is responsible for command, control and operational decisions regarding the country’s nuclear arsenals. “We have a very robust and secure command-and-control system over our strategic nuclear assets. Time has proved that it’s a process that is very secure. It’s a process that has complete civilian oversight through the NCA. The last 20 years are testament to that. So let there be no doubt that any extremist element or somebody like that can gain control of fissile material or a nuclear weapon. There is just no possibility of that. It’s time-tested, and it’s a very secure system that has been put in place. Pakistan is a responsible global citizen, and we’ve shown a responsibility on the ground with this huge war on terror that we’ve been fighting for the last 15 years,” Abbasi said. The Pakistan premier also sought to dispel the notion surrounding the country’s inability to handle its nuclear programmes properly. “We do have nuclear capability. There’s no doubt about that. And we know how to handle nuclear waste. We had a nuclear programme in the early ’60s, one of the first countries in Asia to have a nuclear programme. So if we’ve managed it for over 50-odd years, I think we can continue to manage it,” he said. India and Pakistan held the latest round of talks on the Indus Waters Treaty on September 14 and 15 under the aegis of the World Bank that ended without any agreement. Round II of the discussions on Ratle and Kishanganga hydroelectric projects, over which Islamabad has raised objections, took place at the World Bank headquarters in Washington, amid a chill in bilateral ties. The Indus Waters Treaty was signed in 1960 after nine years of negotiations between India and Pakistan with the help of the World Bank, which is also a signatory. The World Bank’s role in relation to the “differences” and “disputes” is limited to the designation of people to fulfil certain roles when requested by either or both of the parties. The last round of talks were held on August 1, which the World bank said were held in a spirit of goodwill and cooperation. US President DonaldTrump, while announcing his new Afghan and South Asia policy last month, had criticised Pakistan for harbouring terrorists. The Pakistan Prime Minister dismissed links between the Haqqani network and Pakistan’s intelligence agency, the ISI. “We do not condone any activities by any organisation to pose a terrorist threat within Pakistan or to export it to other countries. Nobody wants peace more in Afghanistan than Pakistan. This perception that there are (terrorist) sanctuaries is absolutely not correct. We have defeated the enemy on our own territory. We have destroyed the sanctuaries. And today the cross-border incursions, if they happen, are from Afghanistan into Pakistan to attack our forces. We have told Afghans that if there is any sanctuary that they can give us coordinates for, we will take action against that sanctuary. As far as we are concerned, today no sanctuaries exist on Pakistani soil from which any activity takes place against Afghanistan,” he claimed. Asked about the presence of terrorist groups and individuals like Hafeez Saeed in Pakistan, Abbasi said he belonged to a proscribed organisation. “We have taken action against him. He is in house arrest. In the recent by-election, the candidate did use his picture in an election poster, which is illegal to do, and action will be taken against him by the election commission. We have taken action in the past and will act where it’s required. He (Saeed) has been under detention for over 2-3 years now,” the Pak PM said. US president Trump in his speech had also called on India to help the US more with Afghanistan, especially in the area of economic assistance and development. Asked what role he saw for India in Afghanistan, Abbasi said, “Zero.” “We don’t foresee any political or military role for India in Afghanistan. It will only complicate the situation and not resolve anything. So if they want to do economic assistance, that’s their prerogative, but we don’t accept or see any role politically or militarily for India in Afghanistan. As investors, all countries have the right to trade with each other and invest in other countries. That’s up to them. And India has invested in Afghanistan in the past,” he added. BJP president Amit Shah completes three years in office today, a period that has seen his party rapidly expand base through some deft political manoeuvres.